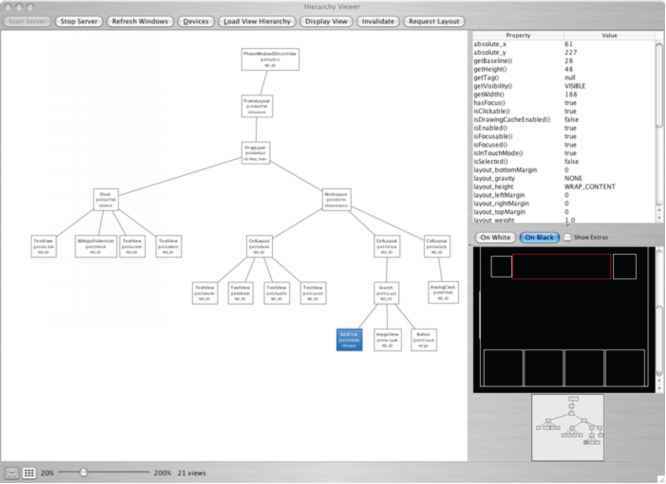 The Hierarchy Viewer application allows you to debug and optimize your user interface. It provides a visual representation of the layout's View hierarchy (the Layout View) and a magnified inspector of the display (the Pixel Perfect View). 2. From a terminal, launch hierarchyviewer from your SDK /tools directory. 3. In the window that opens, you'll see a list of Devices. When a device is selected, a list of currently active Windows is displayed on the right. The <Focused Window> is the window currently in the foreground, and also the default window loaded if you do not select another. 4. Select the window that you'd like to inspect and click Load View Hierarchy. The Layout View will be loaded. You can then load the Pixel Perfect View by clicking the second icon at the bottom-left of the window. If you've navigated to a different window on the device, press Refresh Windows to refresh the list of available windows on the right. • Tree View: a hierarchy diagram of the Views, on the left. • Properties View: a list of the selected View's properties, on the top-right. • Wire-frame View: a wire-frame drawing of the layout, on the bottom-right. Select a node in the Tree View to display the properties of that element in the Properties View. When a node is selected, the Wire-frame View also indicates the bounds of the element with a red rectangle. Double click a node in the tree (or select it, and click Display View) to open a new window with a rendering of that element. The Layout View includes a couple other helpful features for debugging your layout: Invalidate and Request Layout. These buttons execute the respective View calls, invalidated and requestLayoutO, on the View element currently selected in the tree. Calling these methods on any View can be very useful when simultaneously running a debugger on your application. The Tree View can be resized by adjusting the zoom slider, below the diagram. The number of View elements in the window is also given here. You should look for ways to minimize the number of Views. The fewer View elements there are in a window, the faster it will perform. If you interact with the device and change the focused View, the diagram will not automatically refresh. You must reload the Layout View by clicking Load View Hierarchy. • Explorer View: shows the View hierarchy as a list, on the left. • Normal View: a normal view of the device window, in the middle. • Loupe View: a magnified, pixel-grid view of the device window, on the right. A very handy feature for designing your UI is the ability to overlay an image in the Normal and Loupe Views. 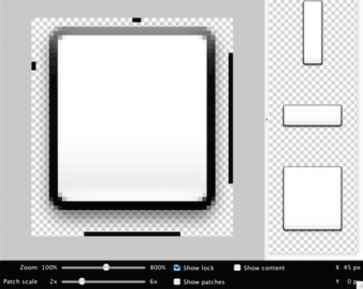 For example, you might have a mock-up image of how you'd like to layout your interface. By selecting Load... from the controls in the Normal View, you can choose the image from your computer and it will be placed atop the preview. Your chosen image will anchor at the bottom left corner of the screen. You can then adjust the opacity of the overlay and begin fine-tuning your layout to match the mock-up. The Normal View and Loupe View refresh at regular intervals (5 seconds by default), but the Explorer View does not. If you navigate away and focus on a different View, then you should refresh the Explorer's hierarchy by clicking Load View Hierarchy. This is even true when you're working in a window that holds multiple Views that are not always visible. If you do not, although the previews will refresh, clicking a View in the Explorer will not provide the proper layout box in the Normal View, because the hierarchy believes you are still focused on the prior View. 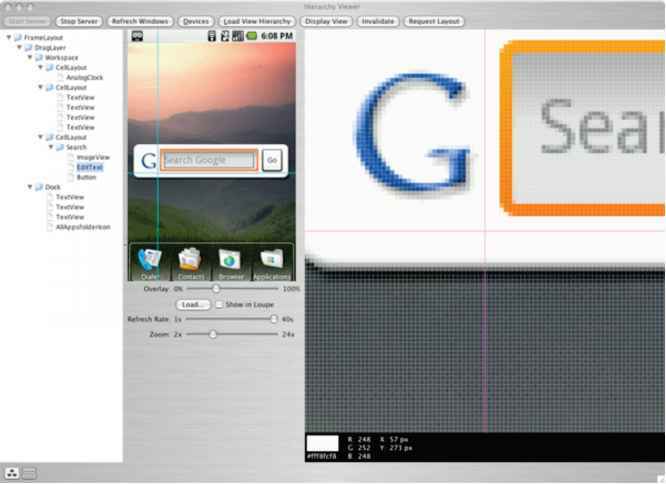 • Overlay: Load an overlay image onto the view and adjust its opacity. • Refresh Rate: Adjust how often the Normal and Loupe View refresh their display. • Zoom: Adjust the zoom level of the Loupe View. Except as noted, this content is licensed under Apache 2.0. For details and restrictions, see the Content License.